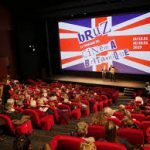 The Drummer And The Keeper continued its festival-winning spree by pulling off an impressive double at the Semaine Cinema Britannique in Bruz, France. Nick’s debut feature won both the Audience Award and the Young Jury Prize. Dermot Murphy, who stars as the troubled drummer Gabriel, represented the film at the festival. This double win brings The Drummer And The Keeper’s festival award tally to an impressive 14, achieved in 7 different countries.